Located on the Devon coastline, Holy Water is an apothecary and boutique owned by Wil and Alyssa. 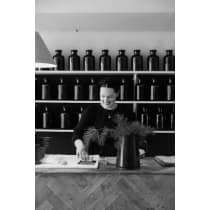 The duo specialise in locally produced, cruelty-free skincare, much of which is made using ingredients foraged from the ocean just 200m from the boutique. Holy Water also sells a carefully considered range of homewares and lifestyle items, all of which have been selected by Wil and Alyssa for their beautiful design and ethical credentials. "At Holy Water we search for and pursue the best organically, naturally and humanely derived skincare products and homewares for your beautiful homes and bathrooms."